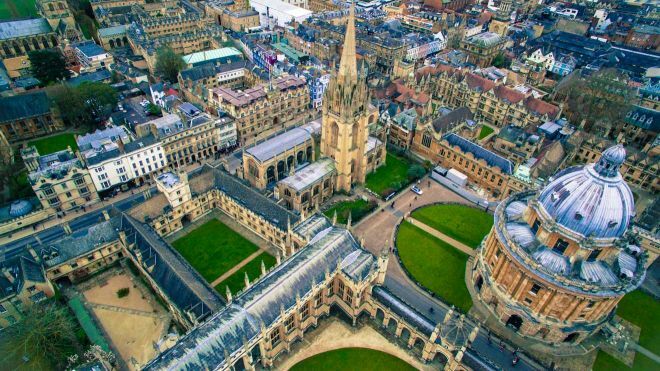 I am sure you have already heard about the city of Oxford in the United Kingdom before, maybe because Oxford University (which is one of the best universities in the world) is located there. But did you know that Oxford has much more to offer than that? Let’s find out which are the 11 top things to do in Oxford! Oxford is the place where Lewis Carroll wrote his “Alice in Wonderland”, where J. R. R. Tolkien gave lectures and worked on “The Lord of the Rings”, where Einstein presented his Theory of Relativity for the first time, where Harry Potter was filmed, where Oscar Wilde studied, where the world wide web and penicillin were invented… And the list can go on forever! Oxford is the place where history lays written on literally every square meter. 27 (out of 54) prime ministers of the United Kingdom studied at Oxford. The list of notable alumni includes Albert Einstein, Margaret Thatcher, J. R. R. Tolkien, Bill Clinton, Lawrence of Arabia, Oscar Wilde, Hugh Grant and Malala Yousafzai (Malala studies at Oxford at the moment). 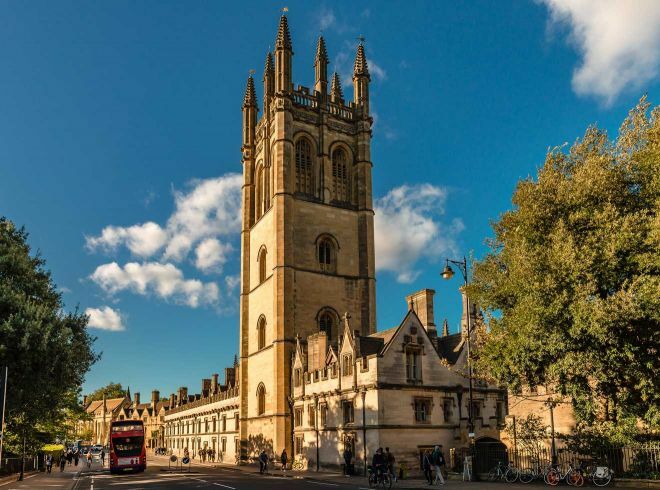 Now, I am sure that after this brief description you will be eager to go and see “the city of dreaming spires” by yourself (it was first called like this way by Matthew Arnold, a Victorian poet, because of the beautiful architecture of the university)! BONUS – For Harry Potter, Narnia and Inspector Morse fans – check out these movie locations! 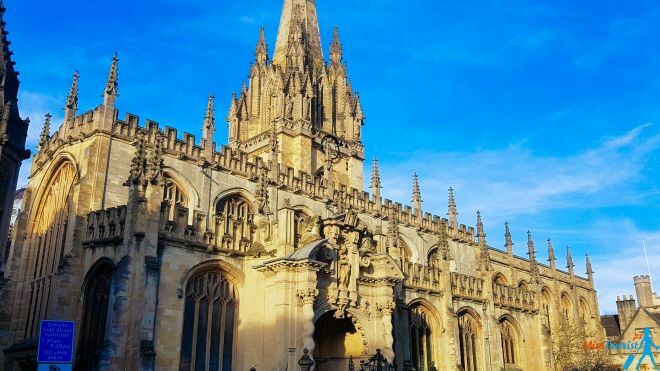 If you want to discover the city properly, I think taking a guided Oxford tour will be the greatest present you can give to yourself when visiting! 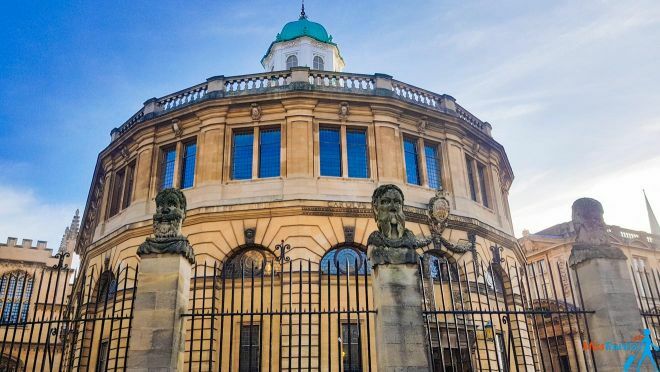 The walking tours I am recommending will take you to the main sights of Oxford such as The Sheldonian Theater, the Radcliffe Camera (“Rad Cam”, as students call it), the Bridge of Sighs and tell you tales of the city that you would otherwise never learn! Taking a guided tour is an activity I recommend to anyone! For example, if you don’t know much about science, literature etc., you will have everything explained to you and you will understand this amazing city better. On the other hand, the people who are already passionate about these subjects will be fascinated by the brilliant people who lived and worked there! Oxford Official Walking Tour – An advantage of this tour is that you get to visit a college and there are usually less people booking it. There are three daily tours available, at 10.45 AM, 1 PM and 2 PM. The official tour is £16 and you can stop by the Oxford tourist information centre (“VisitBritain”) to book your ticket, but I would recommend booking it online in advance, as each time slot is limited to a maximum of 19 people, which means they might run out of your preferred time. You do not need to print the ticket. Oxford Free Walking Tour – This is a nice, interactive tour in English (or Spanish, if you want) and the good part about it is that you decide how much you want to pay for this experience. The only downside is that it is booked by many more people, especially during the high season. I personally found this free walking tour to be more interesting than the official one. There are three tours a day and they start at 11 AM, 12.30 PM and 2 PM. A couple of extra time slots are added during weekends. You can check the updated hours and availability for your dates here. If you are a group of 8 people or more, you must make a private booking on their website. 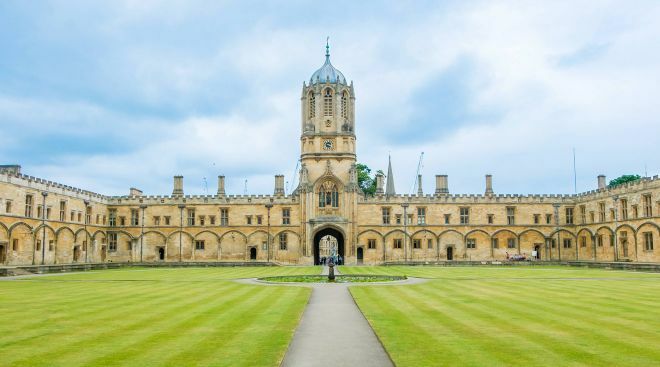 If you would prefer a themed tour instead, there are different ones offered in the city such as the Oxford Harry Potter tour (1.5 to 2 hours), Inspector Morse and Lewis (2 hours), a tour of Oxford University held by a student (2 hours) or you can book a 3-hours private customized tour. Did you know that Bodleian Library is the second largest library in England with 160 kilometers of books? Besides its number of books, the library is, without any doubt, one of the most beautiful libraries in the entire world and one of the main Oxford attractions! PRICE: £2 to enter Divinity School by yourself, £6 for the 30-minutes guided tour that takes you to Divinity School and the library itself (this is the one that I took) and £15 for the 90-minutes guided tour. Check the updated prices and book your tour here. You can also buy your tour ticket on the spot at the Great Gate ticket kiosk. WORKING HOURS: The library is open from Monday to Sunday, but the different areas have different working hours which you can check here. Divinity School is open from 9 AM to 5 PM from Monday to Saturday and from 11 AM to 5 PM on Sundays. The last tour starts at 4.40 PM (the 30-minutes one) or at 3 PM (the 60-minute one). Christ Church College is known as one of the best colleges in England and it is part of Oxford University. Lewis Carroll, 13 of United Kingdom’s prime ministers and many other extraordinary people studied there, including Albert Einstein! If you are curious to find out if there is any analogy between the famous city in New Zealand and this college, let me tell you right away that the city was named “Christchurch” by its founder in honor of his Alma Mater. FUN FACT: The college also has a bell tower and its 7-tonne bell rings 101 times each night at 9.05 PM sharp, as a remembrance of the times when the original 101 students were called back for curfew. Why 9.05 PM and not 9 PM sharp? Because Oxford time is officially 5 minutes later than the Greenwich time zone, which means the bell actually rings at 9 PM. 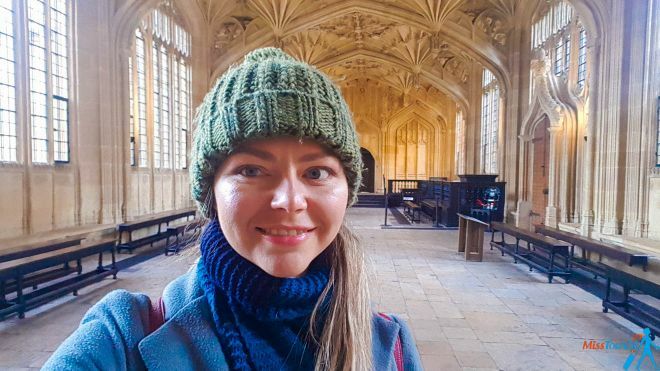 I think the Great Hall is definitely one of the best things to see in Oxford (especially if you are a Harry Potter fan, but not only), even if it is the most expensive part of the building for tourists to enter – £8. FUN FACT2: The original plan of Harry Potter movie producers was to record the dining hall scenes here in Christ Church college, but in the end, they refused the idea. Why? There are only 3 rows of tables in the hall and they needed 4 (one for each faculty)! No matter how much they tried to fit it in and play with camera angles, it didn’t work, so they decided to re-create their own dining hall in the studio, inspired by the one at the college. LIFE HACK ON ENTERING CHRISTCHURCH FOR FREE: Every day at 6.05 PM they have the Choral Evensong at the Cathedral, where everyone is welcome. You must enter using Tom Gate, then look right, before the entrance to the Cathedral – that is the arch where they recorded the movie. NOTE: You will be able to enter the college free of charge, but you won’t see the Great Hall. PRICE: £8 + £0.50 booking fee if you buy it online. Make sure to book yours in advance, as the tickets are released on a weekly basis each Thursday afternoon at 5 PM for the following week. You can also buy them on the spot at the ticket kiosk at Meadow Gate. If the Hall or the Cathedral are closed during your visit dates, you will only be able to purchase the tickets on the spot at a reduced price. WORKING HOURS: from Monday to Saturday from 10 AM to 5 PM and on Sundays from 2 PM to 5 PM, but the last entrance is at 4.15. Please note that The Hall is often closed for lunch on weekdays between 11.45 AM and 2 PM and on Saturdays between 10 AM and 2 PM. Make sure to check the updated schedule here. University Church of St. Mary the Virgin is located right in the center of the city and it is the “spiritual heart” of the oldest university in England. The best part about the church? It has a beautiful tower that you can climb in order to get an amazing view of the entire city! 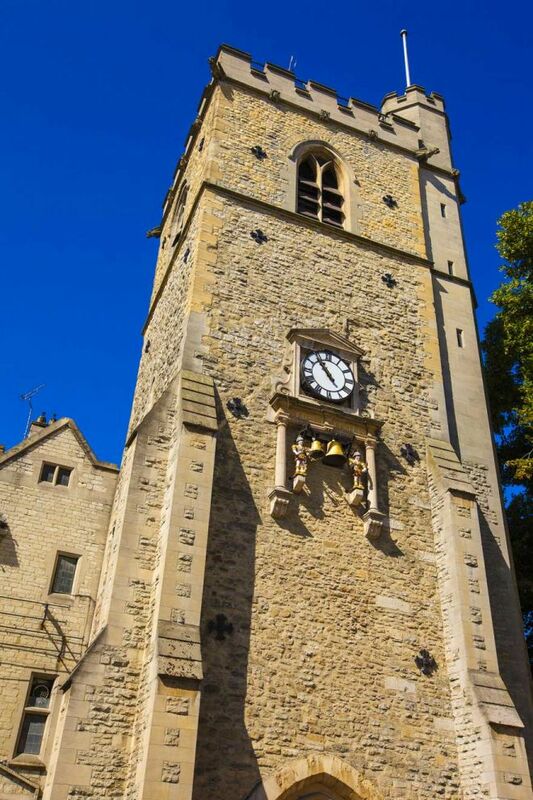 It is said that St Mary University Church Tower offers the best 360 views of Oxford! The tower is actually the oldest part of the entire building that can still be visited today and it was built in 1280! NOTE: The tower can only be reached by climbing a medieval spiral staircase (127 steps) and, unfortunately, there is no other way of access for people with disabilities. PRICE: The church is free to visit, climbing the tower is £4. WORKING HOURS: From Monday to Saturday from 9.30 AM to 5 PM and on Sundays from 11.30 AM to 5 PM. Last entry is at 4.30 PM. You can check the updated schedule here. I guess it goes without saying that, while you are in Britain, you must have a drink in a pub just like the real Brits! And luckily for tourists, Oxford actually has some of the oldest pubs in the world. The bear – It is known as one of the oldest and best pubs in Oxford, dating from the 13th century – 1242, to be more exact! How about you relax in J. R. R. Tolkien’s favorite drink spot? 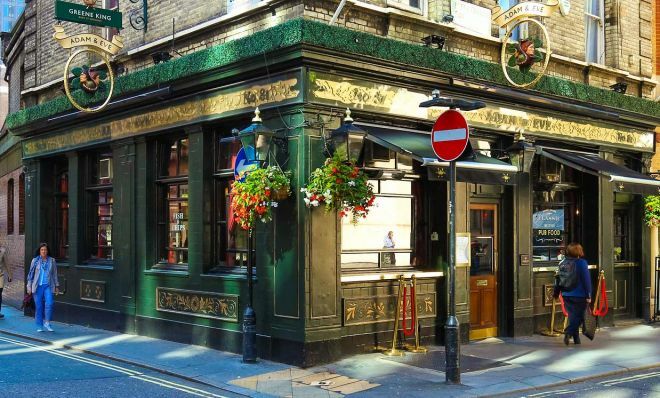 The Eagle and Child was nicknamed as “Bird and Baby” by J. R. R. Tolkien (author of “Lord of the Rings”) and C. S. Lewis (“The Chronicles of Narnia”) and other writers from the Inkling Society. All of them loved to spend their time at The Eagle and Child, read their unfinished books aloud, discuss and critique each other’s work. Definitely the most famous bars in Oxford! Queen’s Lane Coffee House – They claim to be the oldest coffee house that has continuously served coffee in Europe ever since 1654. Great place for a coffee, cakes, sandwiches or even traditional English food. 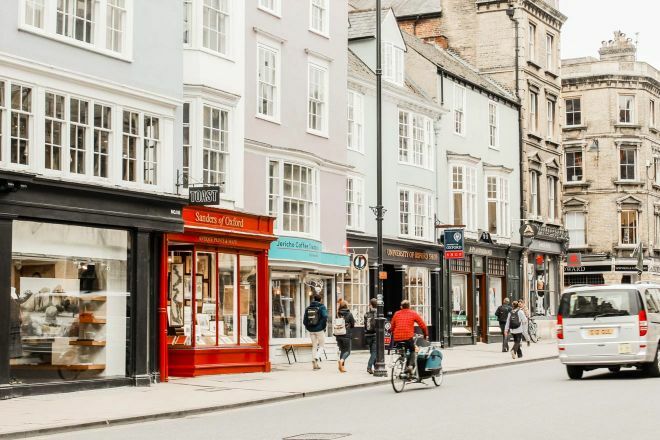 Oxford Covered Market is another interesting place where you can find all kinds of independent stores in one place – they have ice cream, coffee, pizza, flower shops, beauty salons and everything else in-between! Carfax Tower is literally considered to be the very center of the city and it was part of a well-known Oxford Church named “St. Martin’s”. Nowadays, this historical tower is the only part of the church that still exists. The church was built in 1122, while the tower was added a bit later and the church itself was demolished in 1896 because they wanted to make space for traffic. I recommend you to climb the tower up to the top if you want to see an unforgettable birds-eye-view of the city! 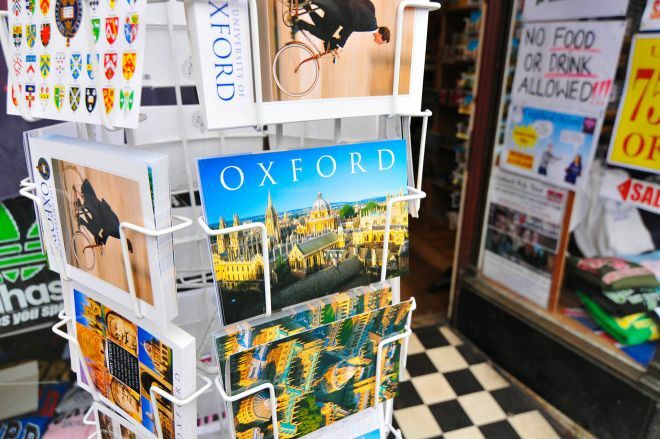 It is the perfect place to take some postcard-like pictures for your vacation and to spot all the main landmarks of Oxford! Moreover, Carfax Tower has the best view of Christ Church College and it is known to be in the top 10 things to do in Oxford! NOTE: The staircase leading to the top has 99 steps and it is a bit narrow. I am a very big fan of botanical gardens and I always try to visit one in almost every city I am in! Of course, Oxford wasn’t an exception and if you, too, are passionate about plants, trees, and nature, I am sure you will love it there! Oxford Botanic Garden has a rather peculiar history behind. It was founded in 1621 and it was a Jewish burial house before that was transformed into the botanical garden we have today. There are two parts that you can visit: The Garden (almost 6.000 different types of plants) and The Arboretum (some of the best conifer collections in England). FUN FACT (well, maybe not so fun actually): The Jewish community used to loan money to the British and, at some point, when the sum became too big, the British preferred not to return the debt. So what did they do? They expelled all Jewish people from visiting Britain! And they reused the Jewish cemetery for their own needs – this is how the botanical garden appeared in the city! 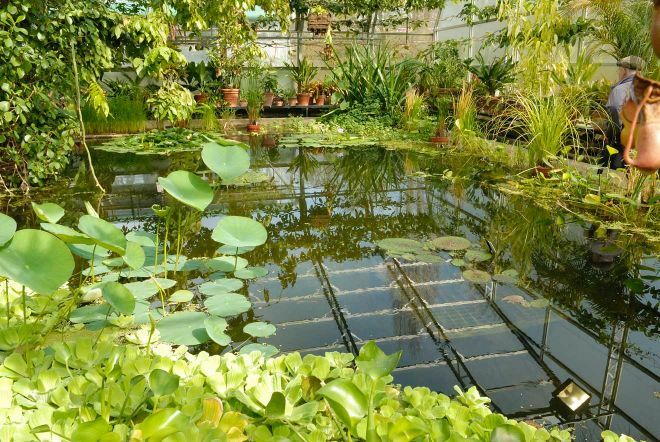 This story happened about 400 years ago; now, Oxford Botanic Garden is a beautiful place packed with incredible plants from all over the world! Plus, they are allowing biology to analyze and experiment with different plants, so they are putting it to good use for sure. All in all, despite its unusual history, I would say that the botanical garden is one of the places to visit in Oxford that definitely deserves your time! TIP: After your visit, you can enjoy a coffee or some tea at their pop-up café that is open from April to September. PRICE: The entrance fee is £5.45 for the full day and you can book it online on their website. Children under 16 years old can enter for free. If you want to find out more, you can also take a guided tour with a trained volunteer (£10) or with a member of the staff (£15) or a curator/director (£20). More details about the guided tours here. WORKING HOURS: 9 AM to 5 PM (March, April, September, and October), 9 AM to 6 PM (May to August) and 9 AM to 4 PM (November to February). You can check the updated opening times for your dates here. Oxford is a city full of history and tradition so, naturally, you can find a lot of museums there! And the best part of all? Most of them are free to visit (although a donation is always welcome and much appreciated). So why not visit one (or more) of them in case you have the chance? 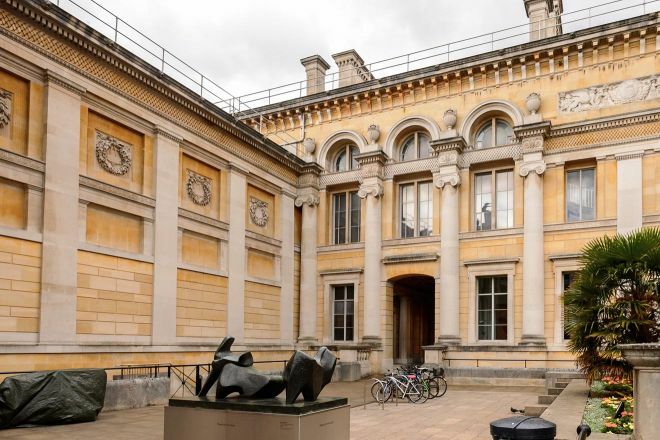 Ashmolean Museum – An amazing five-floor art museum with famous artworks by Michelangelo, Picasso, and Rubens. Unfortunately, I did not have enough time to visit it. The museum takes about 3 hours to visit and they sometimes have special exhibitions with contemporary artists as well. PRICE: Admission is free, the special exhibitions have individual prices. WORKING HOURS: from 10 AM to 5 PM, but they are open until 8 PM on the last Friday of the month (except December). You can find the updated schedule here. Oxford University Museum of Natural History – If you are a fan of natural history, this is the perfect place to go! It is equally amazing to visit for yourself or with kids and you will get to see some awe-inspiring dinosaur skeletons, the most complete remains of Dodo (the famous extinct bird) in the world, whale skeletons and more! On top of that, the museum has the blackboard with the original writing of Albert Einstein with his Relativity Theory which was presented for the first time even in Oxford! WORKING HOURS: from 10 AM to 5 PM. You can check the updated schedule here. They focus on inclusivity at Pitt Rivers Museums and you can see it right away when you step into the museum. If you visit it, you can join a Kumihimo (Japanese braiding) workshop, see a figure from Easter Island, a mummy from Egypt or a priest crown from Ethiopia, and half a million of other eccentric artifacts from all over the world! WORKING HOURS: from 10 AM to 4.30 PM, the only exception being Monday (12 PM to 4.30 PM). You can see the updated schedule here. WORKING HOURS: from 10 AM to PM every day except Sunday (12 PM to 5 PM) and Monday, when it is closed. 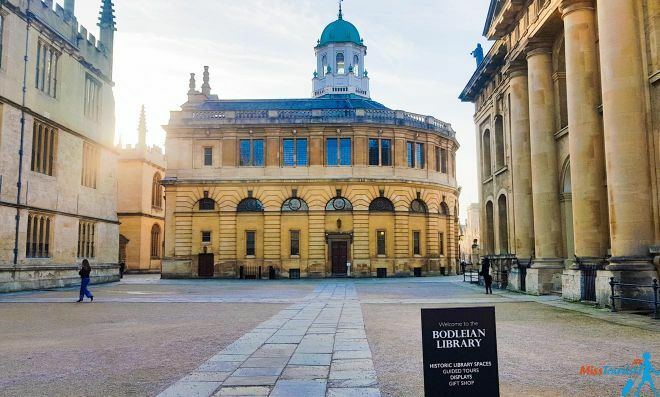 Bodleian Library Exhibitions – Besides being a gorgeous library and the paradise of book lovers, there are also some very interesting exhibitions organized at Bodleian Library frequently, focused on rare books, comics, maps and more! You can check the current and upcoming exhibitions here. If the weather is nice and you are tired of visiting museums and buildings, then why not try some Oxford punting? Punting on river Cherwell is a very popular activity in the city for tourists and locals as well. A punt boat is a small boat with a flat bottom, similar to a gondola in a way, but with square edges. There are different options for you. You can either rent a boat and try to manage it yourself (PRO TIP: Do not put your paddles too deep, they will get stuck!) or you can opt for a chauffeured boat with a driver that will row for you, while you enjoy the city from a different angle! 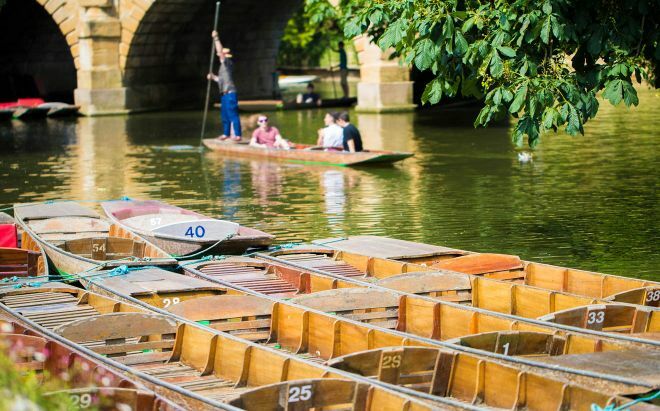 If you are interested in this activity, you can rent the boats from Cherwell Boathouse Oxford or Magdalen Bridge Boathouse. 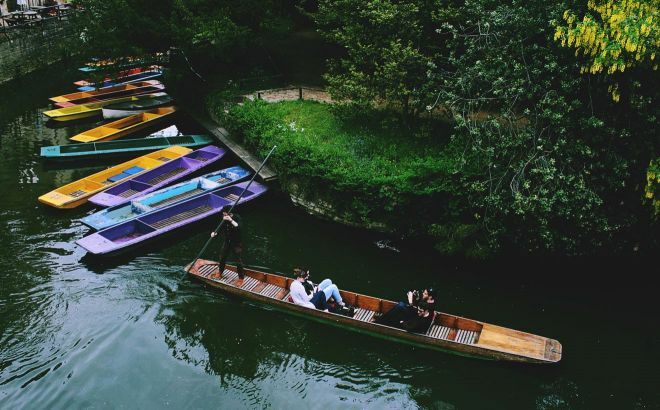 PRICE: The price for punting in Oxford differs a bit depending on the company you choose, but it is around £20 – £22 per hour. The chauffeured boat is a bit more than £40 per hour, but you must make sure to book it in advance. The punt can fit up to 5 people. WORKING HOURS: From 9.30 AM or 10 AM until dusk, depending on the company you choose. Punt season is from February to mid-October. Alternatively, I can recommend you take a river tour if you want to experience the city of Oxford from a different perspective. The cruise season is from April to October and the starting time and duration depends on the tour you will choose. 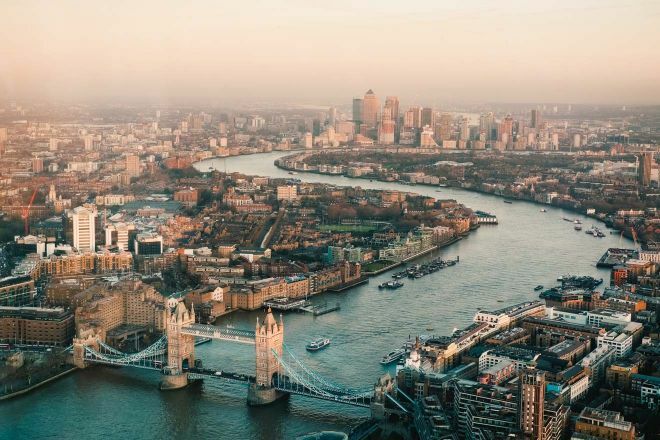 For example, this river cruise is 30-minutes long for £8 and this other one is a 50-minutes long ride that will take you to all the main landmarks of the city for £12. 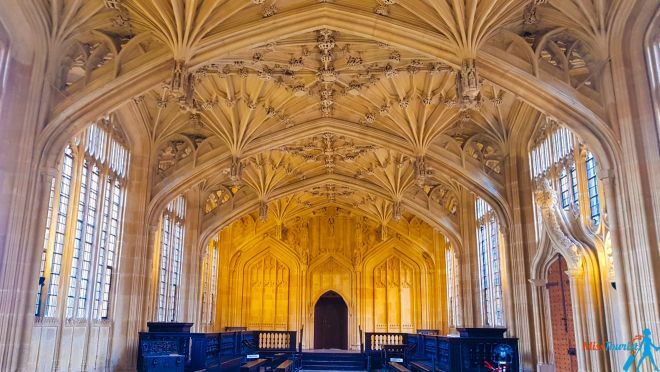 If you still have enough time on your hands and you already visited Christ Church College and it wasn’t enough, then why not pay a visit to one of the other Oxford colleges as well and see how the actual students live there? If you choose to visit, you will hear some fun insights about each college’s traditions, about the rowing competitions and other student activities, if they participate in tortoise races (yes, that’s a thing! ), how much they pay for their education there and many other things that you might find interesting. 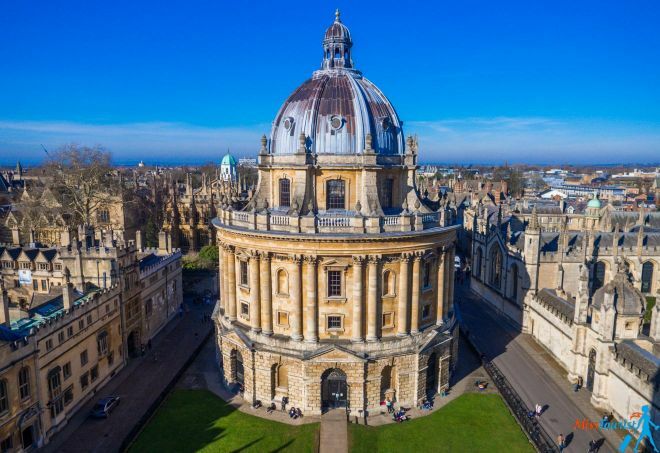 Each college in Oxford has its rules about visiting, so you would have to check for each of them individually using their websites or this list here. 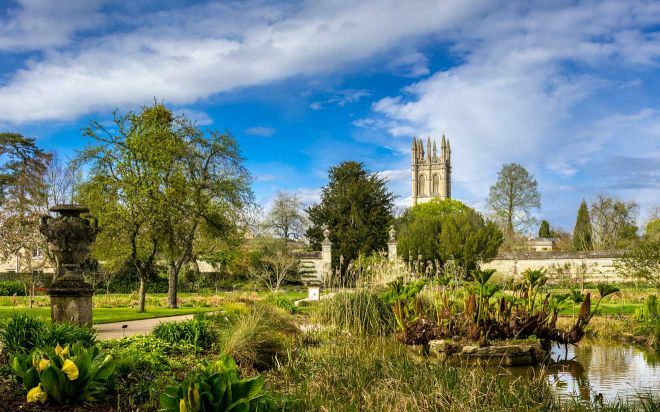 Merton College – open Monday to Friday from 2 PM to 5 PM and on weekends from 10 AM to 5 PM (or dusk if earlier). Admission fee is £3 for adults and free for children. Trinity College – open from 9.30 AM to 6 PM during summer and from 9.30 AM until dusk during winter. Admission is £3 for adults and £2 for children and seniors. If you like Hop-on Hop-off buses in general and you usually take them during your travels, Oxford might be a good place to do it as well. A Hop-on Hop-off bus is a good choice if you want to have an overview of the city or if you want to visit many places in the same day – this way you can get off wherever you want to visit and then board the bus again when you are finished. 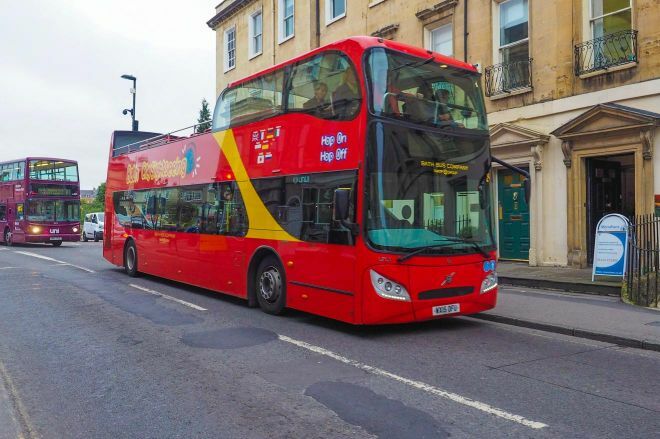 Although you can pretty much walk to any location in the city, if you want to go to Banbury Road or Woodstock Road it would be a good idea to take the Oxford sightseeing bus as you can easily reach these areas and visit the colleges there. I took the tour myself and I don’t regret it at all, especially because with the ticket you are also offered a 30-minutes free walking tour of the city center (re-boarding the bus is required). I wouldn’t say it is a must-do either, but it could be a great option for those with limited mobility, for families traveling with children or for travelers who like the Hop-on Hop-off bus in general. NOTE: Do not let the color of the bus confuse you – both the red one and the green one have the same route. The entire loop takes about 50 minutes. WORKING HOURS: The first bus leaves from the train station at 9.30 AM, but it can be late (in my case it was almost 20 minutes late), so I wouldn’t rely much on its timing. The buses pass every 20 minutes. The last bus departs between 4 PM and 5 PM but it differs for each station, so you can check the exact schedule here. If you are an Inspector Morris fan – The White Horse Pub (featured in the pilot episode), Sheldonian Theatre (some episodes of Inspector Morse were filmed here, as well as the prequel), Bodleian Library (for example, the scene when Lewis and Hathaway interview Professor Gold was filmed here). If you are a Narnia fan – Although many scenes from The Chronicles of Narnia were filmed in New Zealand, the door that actually inspired the wardrobe entrance in the movie is in Oxford! 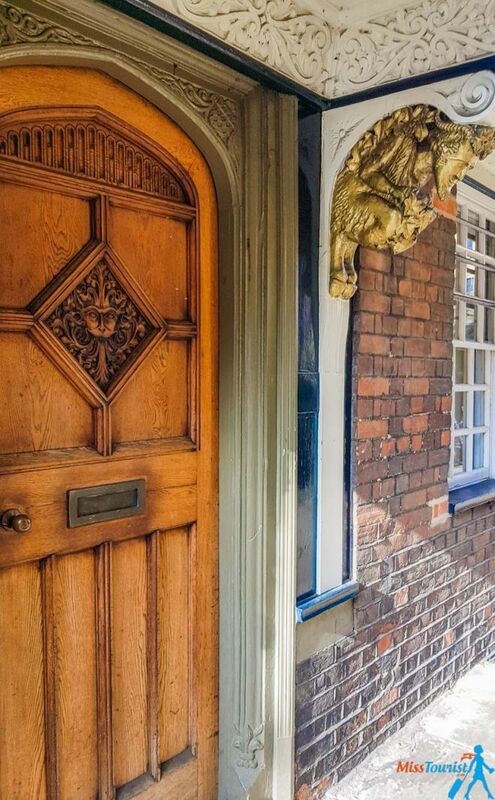 The wooden door with lion head engraving door is located opposite to Oxford University Church’s entrance. Some other locations are the cloisters at Magdalen College (said to be the inspiration for the scene when Aslan brings frozen animals back to life). If you are a Harry Potter fan – Many parts of the Harry Potter movies were filmed in Oxford! Except for the Divinity School at the Bodleian Library (Hogwarts Sanatorium), Duke Humfrey’s Library was used as Hogwarts Library and the Christ Church dining hall was the inspiration for the big dining hall in the Harry Potter movies. Lewis Carroll’s Alice’s Shop – This is the authentic Alice in Wonderland shop and if your kids love this classic story, they will definitely enjoy it there! The shop is “full of all manner of curious things” and the children will definitely love the toys, clocks and colorful ornaments. Oxford Ghost Tour – Oxford is said to be one of the most haunted cities in England, but is that true? You can discover this for yourself if you choose to take the Oxford ghost tour! 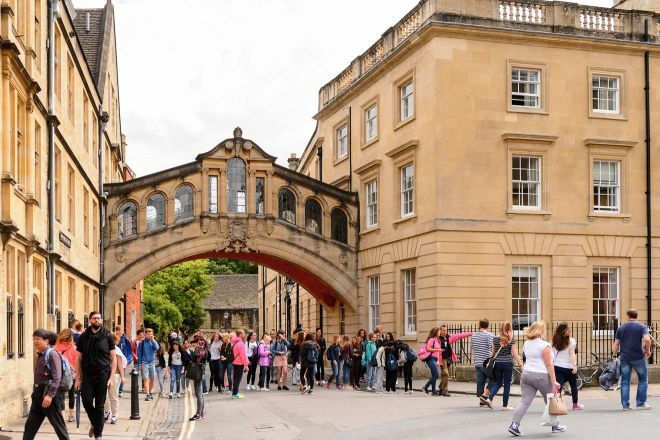 The tour will take you through the city streets and you will learn many interesting stories and urban tales from Oxford! The tour takes around 1 hour and 15 minutes and it starts at 4 PM and 6.30 PM in the winter time and at 6.30 PM in the summertime. The admission fee is £12.95/adults and £5.95/children under 16. You can find more details and book it on their website. The Botanic Garden (mentioned above at #7) is great for visiting with the little ones, as I am sure they will be fascinated by the various plants and flowers! Besides the normal tour, they many family-friendly events and adventurous trails. Please read more information about them here. 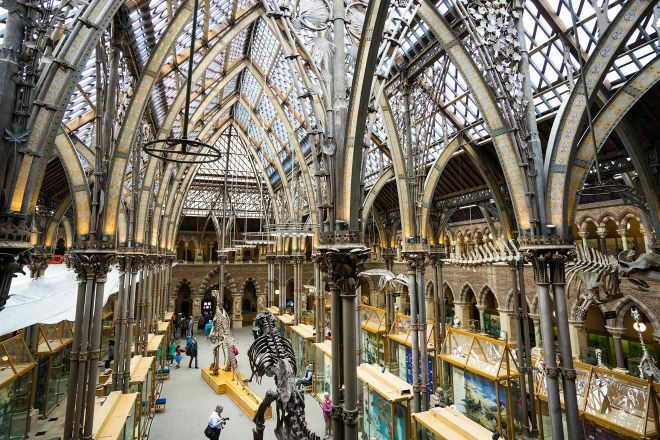 Oxford University Museum of Natural History – kids are naturally curious, so they will definitely love seeing a dinosaur skeleton and many other interesting artifacts at this museum! Plus, the entrance is free for the entire family, so I definitely recommend it while you are in the city. 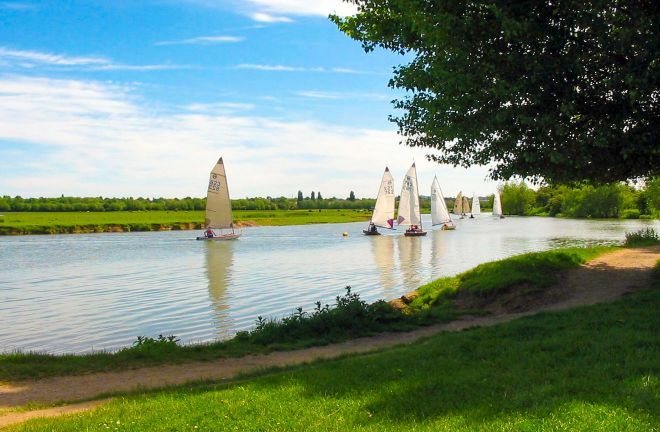 Port Meadow – In case you are looking for some outdoor activities, there is a large, green meadow right in the city that is also easy to reach, so taking a relaxing walk there might be a great idea for the entire family! The little ones can run through wildflowers and gaze at cute horses if the weather is nice! The Story Museum – NOTE: The Story Museum is closed until spring 2020. 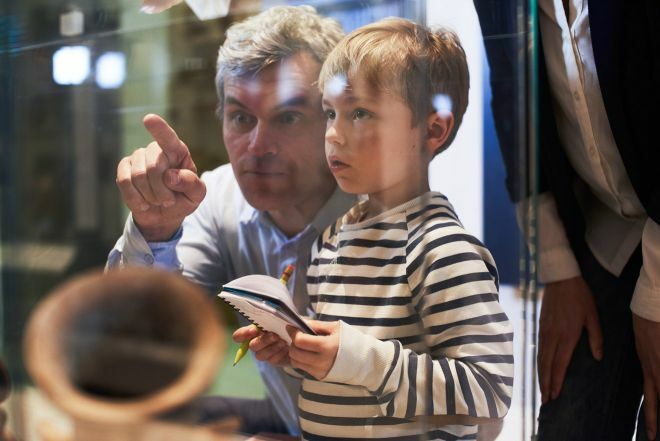 If your kids don’t like normal, boring museums, this is the place to go! This is a fantasy, interactive museum where you can touch, smell and try on pretty much everything! There is no strict route that your kid should take, so he/she will be able to create its own story – what can be better? Note that the place is only open during weekends and school holidays. If the weather is good, renting a bike (around £12/day) and exploring the city would also be a good idea for you and your kids! 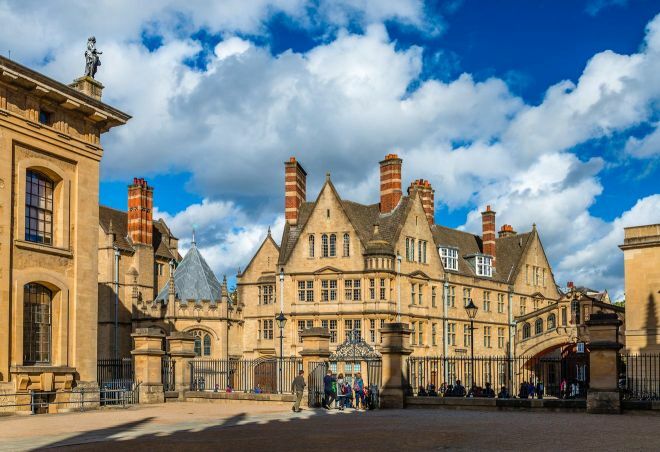 If you have already visited the main sights Oxford has to offer and you still have some time left, why not dare and discover the surrounding area as well? If you want flexibility and being able to visit things at your own pace, I think renting a car would be a great idea! This way, you can organize your own road trip outside the city where you can visit only the things you really want to see and spend as much time there as you wish! Here is a good site to check all the current prices for car hire in England. In case you are not fond of the idea of renting a car, you can just take a train to the places you wish to visit or take organized tours. Blenheim Palace is a gorgeous early 18th-century palace and the birthplace of Sir Winston Churchill! It is recognized as a UNESCO World Heritage and I can say it is magnificent and totally worth a visit! The palace also has some gorgeous gardens that you can visit, as well as some special Churchill exhibitions and more. 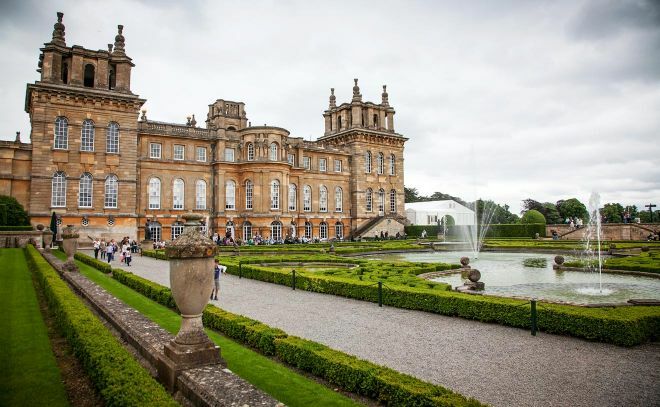 Blenheim Palace is located in Woodstock, only 20 minutes away from Oxford. In order to get there, you can take the “S3” bus from Oxford to Woodstock. It departs Oxford train station and Gloucester Green bus station and it gets you right to the gates of Blenheim Palace. The bus runs every 30 minutes. There are some other ways to get there – you can check them out here. PRICE: £27 for the Palace, Park and Gardens and £16 for the Park and Gardens only. WORKING HOURS: The palace is open from 9 AM to 4 PM or 6 PM (depending on season). Check the updated opening times here. In case you are a fan of medieval castles, you are in luck! Warwick Castle is a beautiful one, full of history and myth, built in 1068 by William the Conqueror. 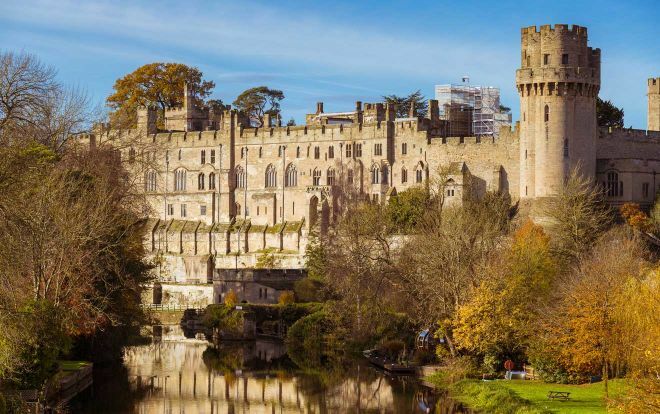 You can visit the castle and its dungeons, take a Warwick castle tour, view the daily shows (Bowman shows or trebuchet, for example) or participate in activities such as the Knight School, where you can learn tactical defense skills with the castle’s knight. It is definitely one of those memorable things to do around Oxford! Warwick Castle is about 50 minutes by train from Oxford and the ticket is around £19. You can check the updated prices and schedule here. WORKING HOURS: The castle is open every day from 10 AM to 4 PM. Are you a fan of William Shakespeare? If yes, then you should know that Stratford-upon-Avon is actually the place where he was born and where he lived and created during his life! 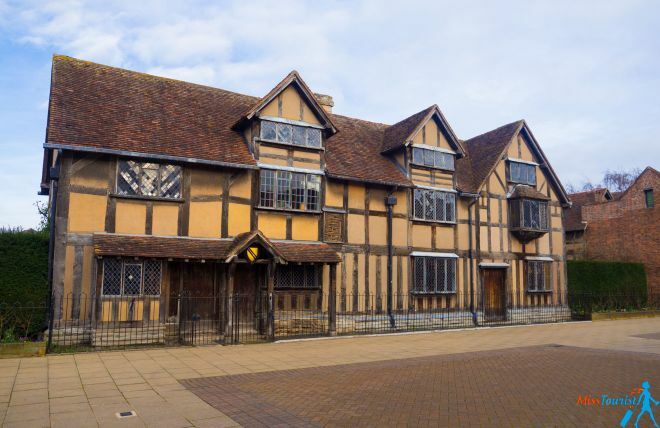 Stratford-upon-Avon is a charming little city full of interesting things to do and some gorgeous Shakespeare-related houses that tell the true story about his life! If you want to read more about the city, here is my article about 11 Best Things To Do In Stratford-Upon-Avon! Stratford-upon-Avon is located around 1h30’ – 2 hours by train from Oxford. The train ticket is around £20 and you can check the updated prices and schedule for your dates here. I am absolutely sure you have already heard about Stonehenge before! Stonehenge is the most popular prehistoric monument in Europe and one of the wonders of the world actually! Luckily, Stonehenge is close enough to Oxford to visit it as a day trip. In order to get there, you can take a train from Oxford to Salisbury train station (2 hours, around £35) and then you can take the Stonehenge Tour bus. PRICE: £17.50/adults. You can check the updated prices here. 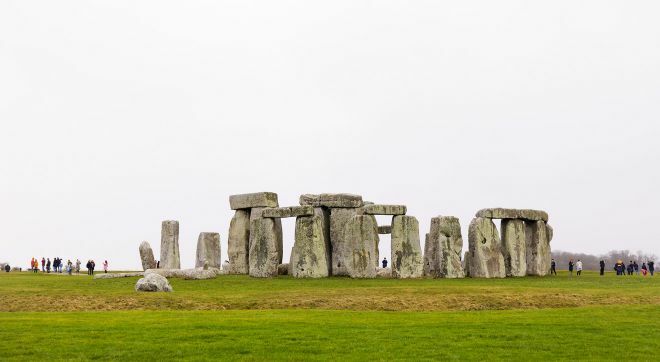 NOTE: If you want to visit Stonehenge and Oxford as a day trip from London, this 11-hour organized tour will take you to Stonehenge, Oxford, Windsor. Another beautiful English castle, Broughton Castle is located near Banbury, not far away from Oxford. 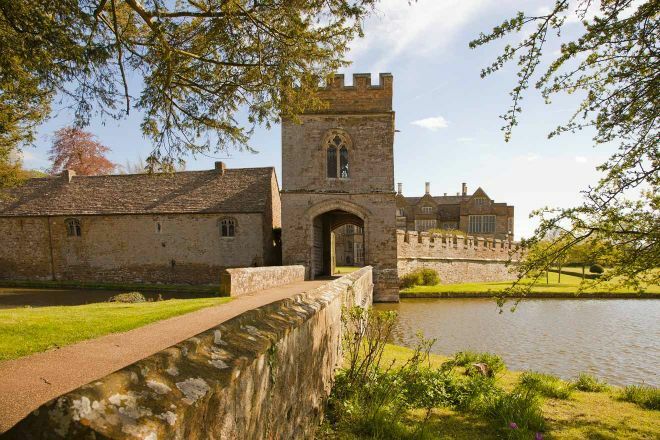 It dates from the 13th century, and if you are a fan of fairytale-like castles surrounded by gardens and water, this is the perfect place to go! To get from Oxford to Broughton Castle you can take a train to Banbury (around 15-20 minutes, £5 or £6) and then you only have to take bus 3A to Broughton (£4), which will leave you right at the castle. PRICE: £10/adults. You can check the updated prices here. If you love gardens, I have just the right place for you to go! 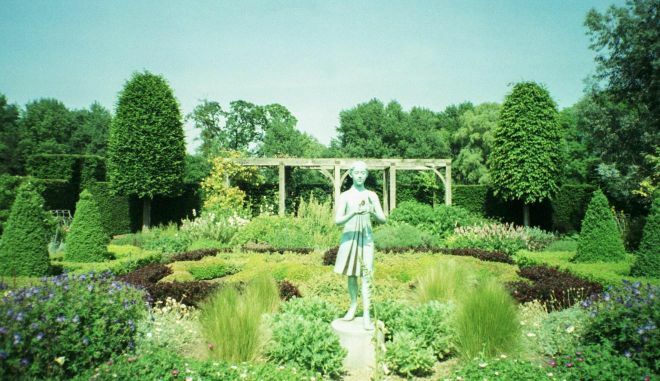 Waterperry Gardens is one of the most beautiful and relaxing attractions near Oxford and it consists of 8 acres of gorgeous ornamental gardens and a plant center. Plus, you will also find there a gift shop, a little museum, and a tea shop! If this sounds like your kind of thing, you should know that Waterperry Gardens are located very close to Exford! PRICE: £8.50 to visit the gardens, access to the rest of the estate is free. WORKING HOURS: from 10 AM to 5.30 PM. You can check the updated prices and schedule here. 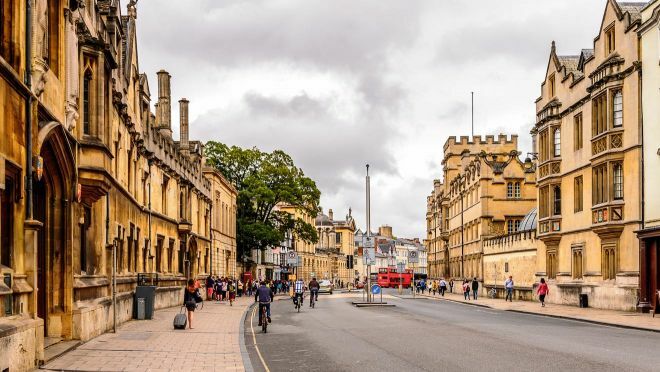 It is true that Oxford city is not that big but, even though you can see and appreciate its beauty and history as a part of a one-day trip, I think 2 days would be the optimal minimum period if you want to see all the main sights with no rush! If your vacation allows it, you can definitely stay even longer and I assure you that you won’t run out of things to do for at least 4 days – especially if you want to visit all the museums the city offers! Take a tour of the Harry Potter Studio and visit Oxford as a day trip from London for £99/person with this organized tour. 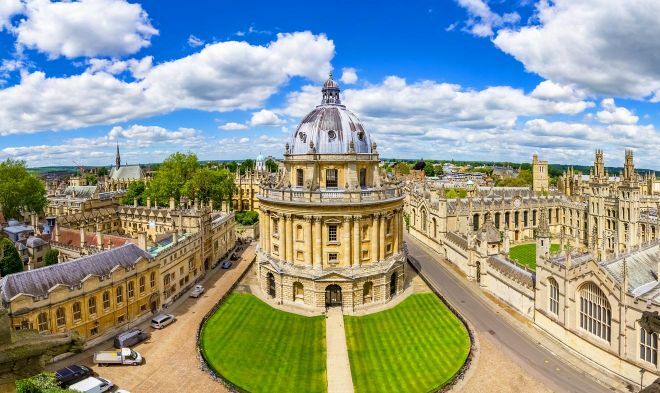 Day trip from London to Oxford, Stratford-upon-Avon and Cotswolds (a beautiful country-style area with golden stones and green hills called “wolds”) for £48/person, which you can find here. Take a day trip from London to Oxford, Stratford-upon-Avon and Warwick Castle with this tour for £59/person. See the Stonehenge together with Oxford and Windsor in an 11-hours day tour from London. 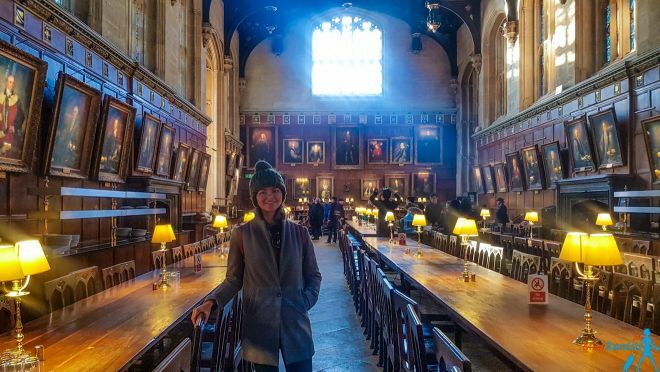 During your vacation in Oxford, you can stay in one of the famous colleges and eat together with the students at the big table just like the Harry Potter movies! The best part about this option is that often times it is even cheaper! I chose this option for myself, too, and I stayed in Rewely House. I can definitely recommend it, as my room was nice, clean and spacious and I paid about £90/night for my dates. The best part of all was that the accommodation is located very close to the city center, so everything was within walking distance! Please note that this is not a proper hotel, but a campus-type of accommodation for students where tourists can stay as well. The accommodation has a good quality and you will also get a front desk where you can check in, check out and ask questions and even room service, so I personally felt no difference between this type of accommodation and a normal hotel! Luxury (£130 and up) – The Old Bank is one of the most gorgeous 5-star Oxford city hotels! Actually, the property is located only 500m away from Oxford University, the rooms are gorgeous and clean and you will also benefit from free Wi-Fi! Old Parsonage Hotel is one of the best hotels in Oxford city centre and a great boutique accommodation in Oxford that awaits you with 2 terraces, a beautiful garden library, a restaurant, and even a bar! Middle-price (from £90 to £130) – Sabine Barn B&B is a super nice 4-star bed and breakfast in Oxford that offers an amazing experience! The only downside is that it is located a bit far away from the city center (8km from Oxford University). Other than that, you will serve a delicious English breakfast each morning and the place is surrounded by authentic Oxford pubs! 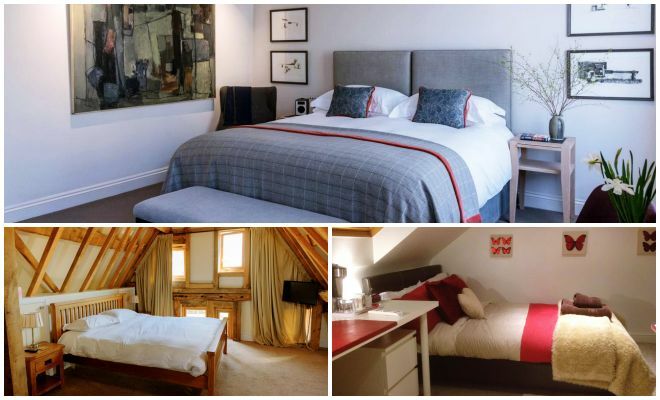 Your Oxford Stay is another B&B in Oxford city centre with a very nice taste in décor and super friendly staff! You will have free Wi-Fi, a beautiful room and a good breakfast every morning of your stay! 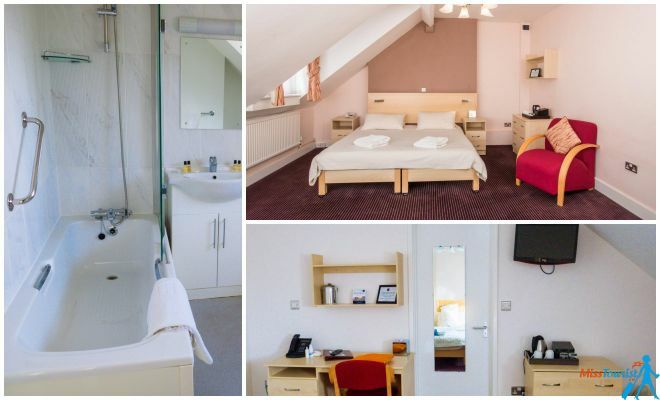 Budget (up to £90) – Arden Lodge is a very nice and accessible bed and breakfast in Oxford that offers very good quality for its price! It is not that close to the city center, but you will get free Wi-Fi, private bathrooms for each room and more! Abodes B&B is another one on my list of great, cheap hotels in Oxford that offers some very affordable packages as well. All the rooms are neat and nicely decorated and the accommodation is very close to the bus station that will take you to the city center! If you want to get from London to Oxford by bus, you can take a National Express Bus. Choose the stop called “Gloucester Green”, this is the station that will leave you right in the city center. You can buy your bus tickets directly from the bus station or you can book them online beforehand on their website. The ride takes around 2 hours and the ticket is around £9 one way. Another option would be to take X90, a direct coach bus that connects London to Oxford and the other way around. The price is £8 per adult one-way and £14 round trip. Kids under the age of 16 can travel for free with X90! 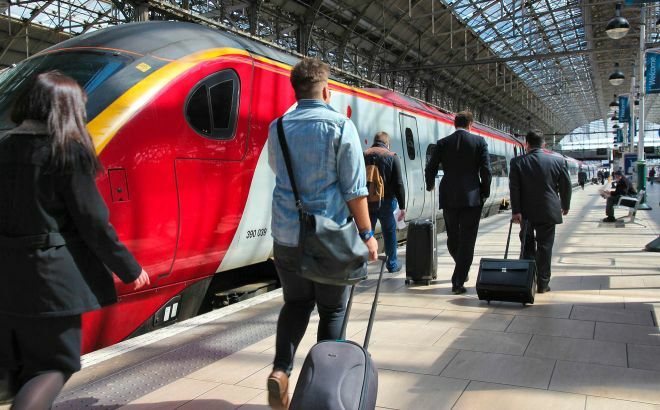 Getting from London to Oxford by train is a bit more expensive, but also faster. The one-way trip takes around one hour and the ticket costs around £15 – £20, depending on how far in advance you buy it and the hour you prefer. You can check the timetables and prices for your desired route using TrainLine. Renting a car is always a good idea for discovering a certain area, especially in the United Kingdom, where all the roads are good and they will get you through some beautiful, rural landscapes. You can check all the offers available in the UK from different companies here. If you want to return from Oxford directly to any airport in London, you can take a bus from National Express. For example, the ride from Oxford to Heathrow takes 80 mins and the one-way trip is £24/adult. The buses depart every 30 minutes. You can check more details on their website. A ton of merchandise with Harry Potter (anything from real-size wands to themed notebooks), with Lord of The Rings and Alice in Wonderland. If you are in the mood for regular shopping, I suggest you go to Westgate Oxford – this is a new shopping mall located right in the city center. Oxford, also known as “the city of dreaming spires” is a gorgeous town in England that offers so many things to visit and experience! Other than the world-famous Oxford University, the city by itself has a unique charm and it is full of history and great stories from one end to the other. While wandering on its streets you will encounter a lot of charming shops, pubs that are 800 years old, awesome bookshops that look small from the outside but are a real gem once you are inside and more! This city will leave you with a feeling of déjà vu all the time because so many great movies were filmed here! 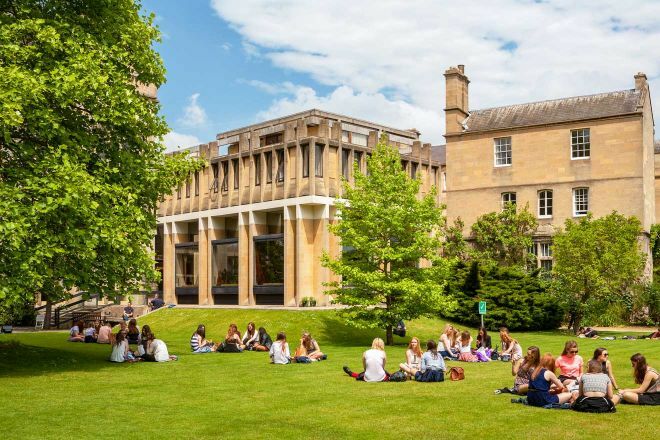 Oxford is the city where history is being written in front of your eyes every minute (by the way, did you know that Malala Yousafzai studies Philosophy and Politics there now?). During my visit, I actually met an elderly couple who spent a week in Oxford and I can say I was a bit jealous! There are countless things to do in the city and it is definitely worth it to visit it as more than a day trip – at least 2 days in the city are needed if you want to truly experience it! 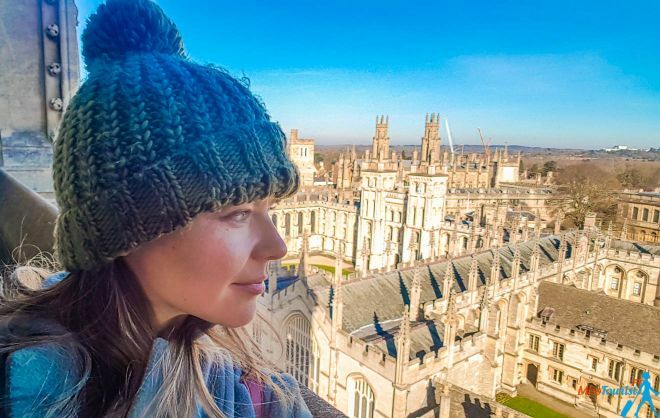 I hope you enjoyed this list of 11 best things to do in Oxford and I hope I helped you plan your itinerary for the city! As usual, if you have any questions or things you wish to know, please tell me in the comments below, I am always happy to answer! Happy vacations! Great post, Yulia. I do think that 2 days in Oxford would be perfect for travelers to enjoy the area. Personally, I won’t recommend rushing the tours, but 2 days is definitely a nice and slow pace already. HI Agness, thanks for the comment!